Tarapoto is a city in northern Peru, situated in the San Martin Province of the San Martin Region. 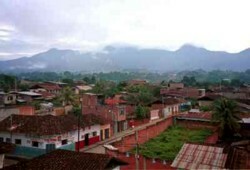 Although Moyobamba is the capital of the region, Tarapoto is its largest city. It is often used by tourists as a starting point for excursions into the Amazon Rainforest tour. It is seved by the Cad. FAP Guillermo del Castillo Paredes Airport. Tarapoto is home to the Universidad Nacional de San Martin, an important center of higher education serving the professional and technical needs of the bio-diverse region. With its active night-life, Tarapoto offers a wide variety of hotels and Peru restaurants in and around the city. Moreover, beautiful landscapes, amazing waterfalls, lagoons, and adventure Peru tourism, such as river rafting and hiking in the tropical Andes, attracts numerous visitors to the "City of Palms".